Dawn of Titans v1.27.0 Mod apk + Data for Android. Lead EPIC TITANS into monumental 3D battles, featuring THOUSANDS OF TROOPS, all controlled by you. 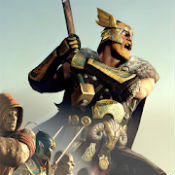 Wage WAR against other players and CAPTURE their land through the might of your army and your skill on the battlefield. With console-quality 3D graphics and ultra-addictive gameplay, Dawn of Titans Mod begins a new-era for Action Strategy MMO games. *NOT go to shop and purchase gems! Free shopping means if you have enough resources or gems it will not be used up. Go to play store and download this game. Now go ahead and uninstall the play store version of this game you just downloaded. Download our modded apk file from below. Install the modded apk, but DO NOT run the game yet. Done! You can now run and enjoy the game. Note: It seems like there is a server check on lvl 16 which crashs the game. Note 2: I cannot start the game on my Bluestacks Emulator, maybe Android 4.x support stopped for that game? If you reach lvl 16 the game will crash with the MOD APK. It seems like the server make a validation check. Remove the mod and install the game from the playstore. After you logged in, level up to lvl 16 and play a little bit. The Server goes sure now, that the game version is legit. After you see the game is running on lvl 16, you can remove the playstore version and install the mod again as you always did. You can even download Data from in-game. Which one to download? If you don’t know you device’s GPU, you can download CPU-Z from play store for free to get your GPU renderer. You need to download both obb pt.1 and pt.2 to extract. If you download obb from mirror 1, you need to download both pt.1 and pt.2. If you download obb from mirror 2, you need to download both pt.1 and pt.2. The Game keeps crashing. any fix to this problem? can you hack new version? Hi guys!! Looking forward for the update of this mod!! This mod is working fine so far i’m lvl 14. The gems dont decrease as promised, but however i cant buy those items which are very costly like youll have to spend around 20000 gems or so because we all start off with only around 500 gems. and currently now I have 6000 gems and they dont decrease, could you make such a mod in which it increases after each purchase? How long are you required to be level 16 before you may reinstall the modded APK? I’ve grinded to 16 and now I’m worried my effort is going to be wasted. I got Banned with just 15 mins playing. I’ve only been playing for 1 hr and I left game when I got back on I got banned. I wasn’t even lvl 16 yet, lol. But seriously is there a fix for this or will there be in the next mod update, or not at all. Great mod tho. can you guys hack this version for us..
Update pls.. awesome job guys!! Update please.. totally awsome job guys!!! please help, where i can find “Set or Change PIN” ? where i can find “Set or Change PIN” ? in my google play setting menu, “Set or Change PIN” is not there.